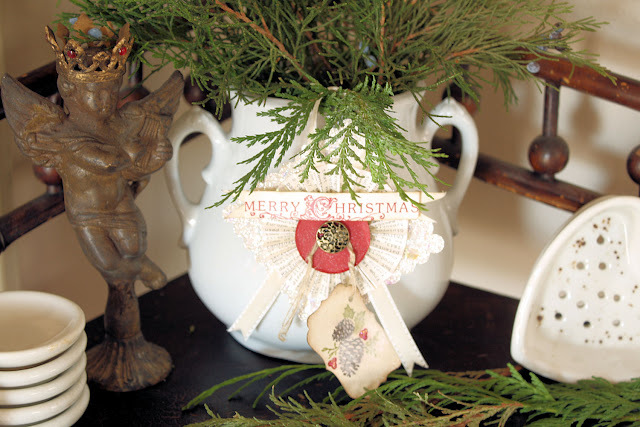 Merry Christmas Blogland! My table is set and ready to let the overeating begin! LOL! My table is an uncharacteristically whimsical one this year. 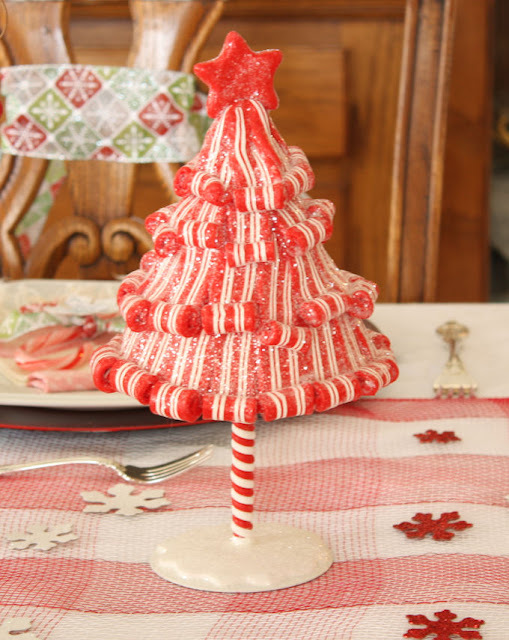 The inspiration came from these ribbon candy trees from Hobby Lobby. I saw them in late November and my initial plan was to replicate them with polymer clay, but then a short time ago, they were on such a good sale that I decided I could just purchase 2 and call it a day. 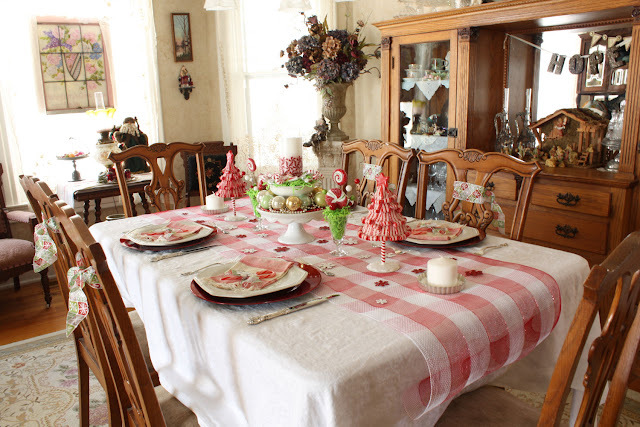 I found the mesh at Hobby Lobby and cut a length of it to use as a runner over my ubiquitous antique white damask tablecloth. 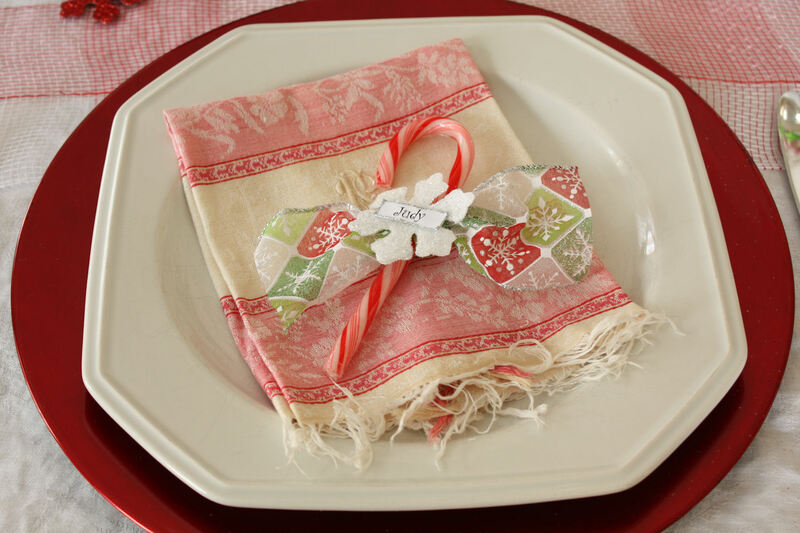 I wanted to reinforce the theme of the candy canes and red and white with a touch of green, but I didn't want another tablecloth to purchase (or store), so this was a great alternative. I've always enjoyed setting a pretty table, but as far as "tablescaping", I feel like I'm a newbie, but one thing I think is key to being easy on your budget: it doesn't seem to matter as much what elements you pull together as long as they are thematic or related by color. 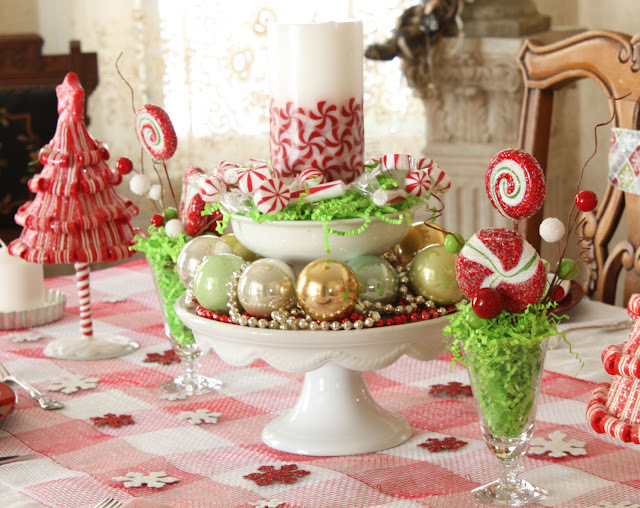 Obviously, in my case, the theme was red, white, and a little green peppermint candy, but I added little sparkly snowflake confetti in red and white and some ribbon that I already had was used for the chair backs and the peppermint placecards. 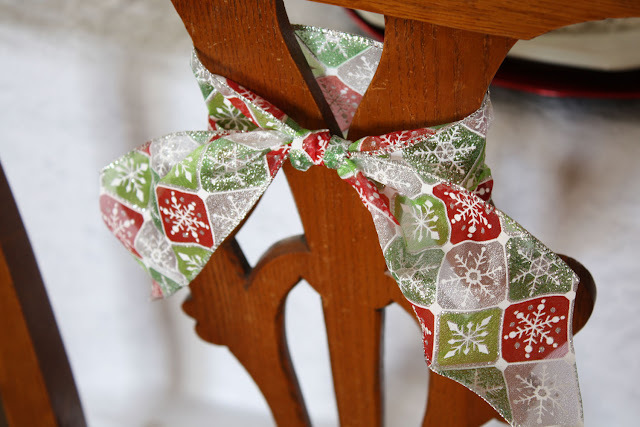 Both of these were appropriate in color and, due to the fact that the ribbon had sparkly snowflakes on it, it also related back to the little snowflakes scattered on the table. Does that make sense? You don't have to be too literal in your theme, just have some thread of continuity flowing through each piece whether by color, broad subject, or both, and you'll look all put together. The napkins are antiques that I've had for a few years. A little glass from the china cabinet stuffed with bright green shred which I had saved from some kind of package and almost threw away because after several months, I had never used it. HA! Glad I had it because it came in handy. LOVE when things finally work out per plan, don't you? Stacked an ironstone butter dish on top of an ironstone cake plate (yes, they are both antique, don't hate...). 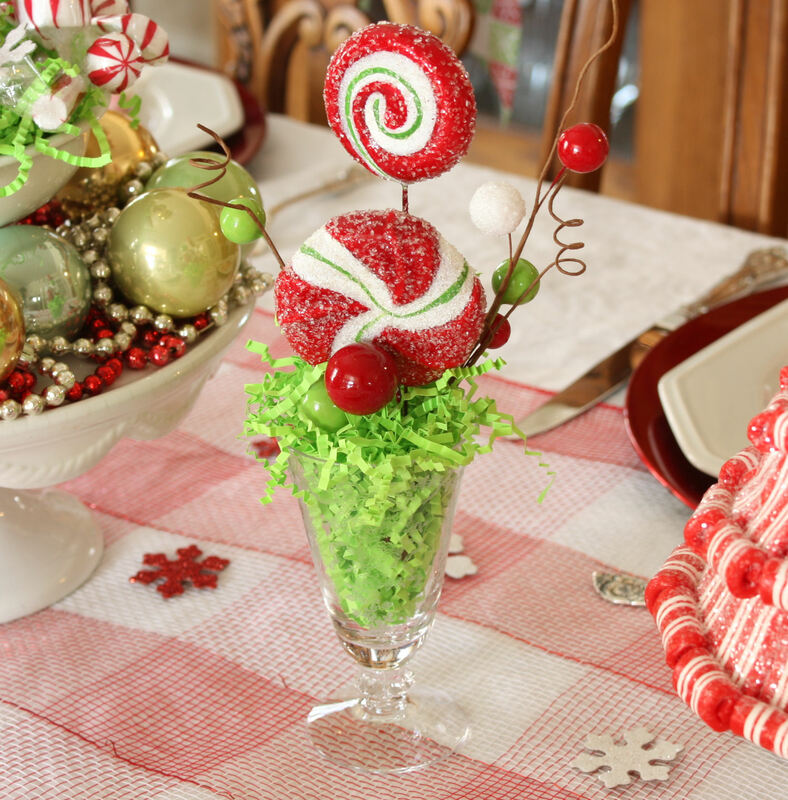 I think for Christmas Day, I'll replace the balls and glass garlands with peppermint bark. 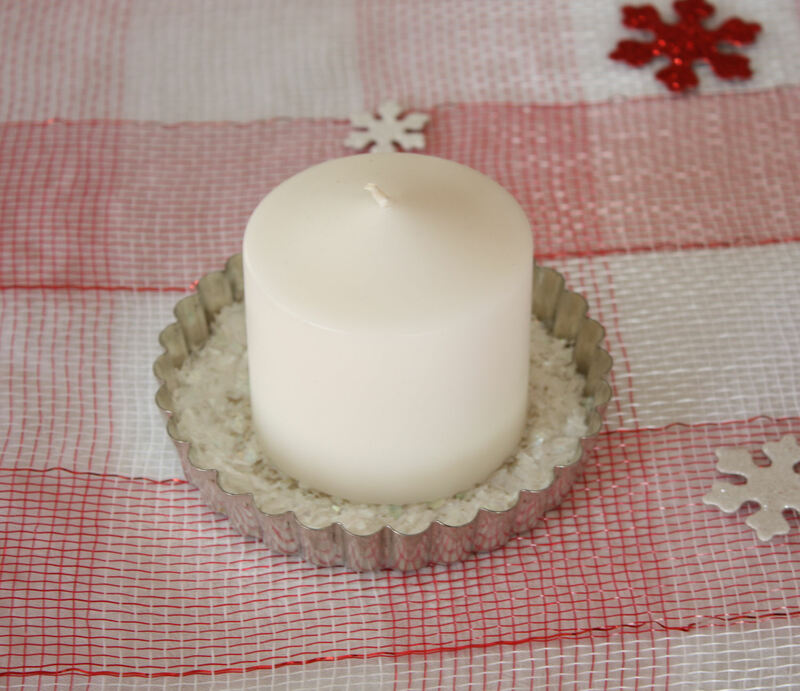 The little white candles I had already and I put them in French tart pans. A little sparkly faux snow (tying back to both the food and the snowflakes) to catch any drips and call it done. I've never had chargers before and didn't want to pay $1.99 each for them at Hobby Lobby, but then I went to WalMart and found them for .99. Much better. Found the adorable peppermint candle used in the centerpiece there as well for half price ($4 I think?). Everything else was already in my possession, so no additional cost (yay! ), so the grand total is $31.35. I know some of you gals could have done this for $5, but I think that for minimal effort and a minimum of looking for bargains, I'm pretty happy with the result. Also, now I have added a few things to my "decor stash", so next year, even less to buy (that's what I told hubs anyway...). This will be my last post of the year, so from my home to yours, have a very beautiful and bright holiday season with friends and loved ones and I'll see you in 2012. 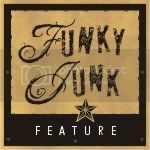 Saturday Night Special at Funky Junk. I have, over the years, loved the look of red and white together, particularly at Christmas, but after loving the whites and the pastels and the neutrals, I thought I had kind of fallen out of love with good old red and white. Low and behold, when I started pulling out things to decorate for Christmas this year (remember use what you have simple? ), I decided to use my white ironstone more prominently than I usually do. 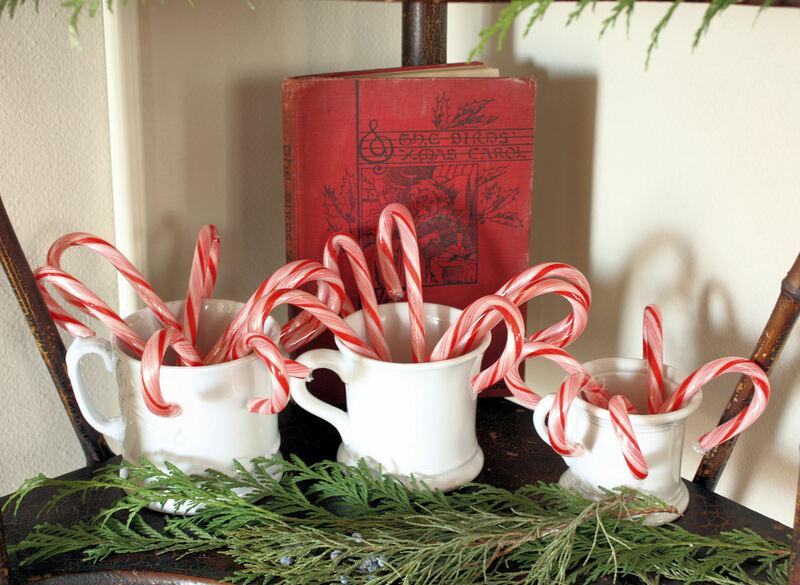 What better to punch up white ironstone than greens and candy canes? Well, nothing, says I! So I went out to the yard for some greenery and to my neighborhood KMart for some candy canes and ribbon candy and...voila! 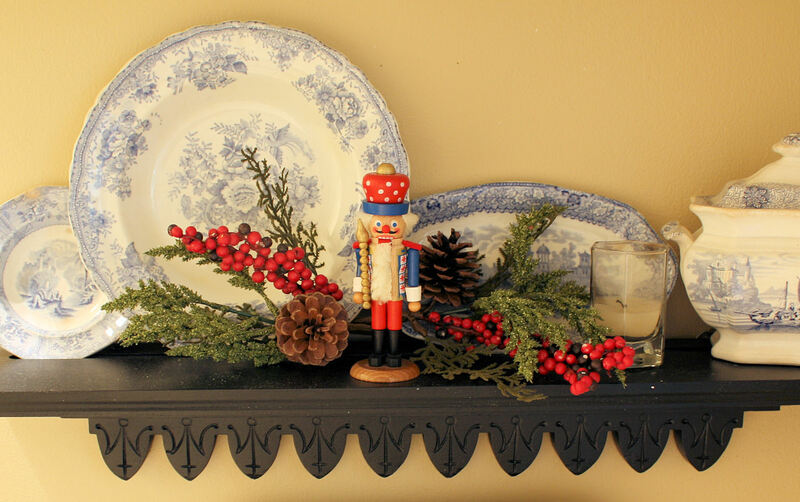 I had a ball with this sideboard vignette and red seemed to enter into it as well, although in a much more subtle way. 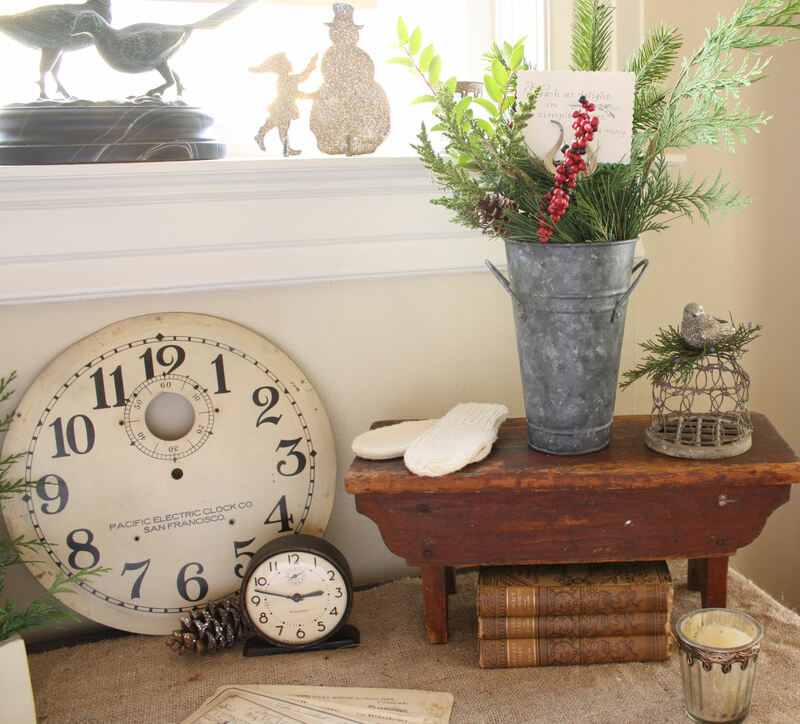 The little stool is an old red and one of my favorite things from my New England days. A touch of red berries add a little pop to the greenery in a new thrift store galvanized vase given my old zinc paint trick. Fun chance to pull out my Christmas books and my adorable drawer I won in Mitzi's giveaway along with the awesome little black alarm clock, among other awesome treasures. Thank you, Mitzi! 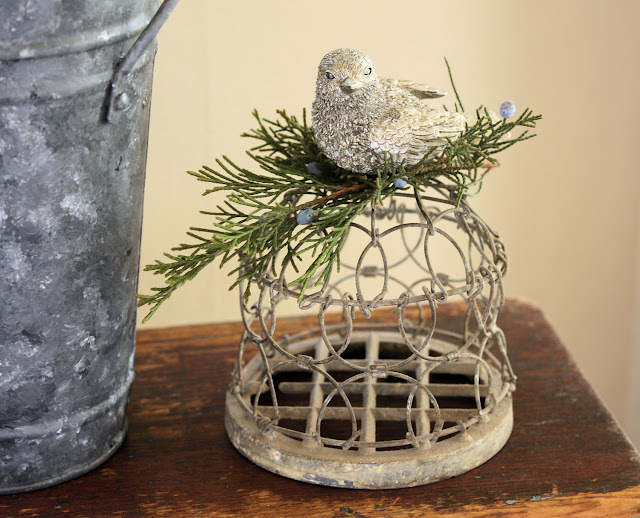 One of my favorite little doodads, a very cool flower frog topped this month with a bird Christmas ornament and some greenery. My friend down the street is a talented calligraphy and watercolor artist. She had an open house for Christmas and gave us all a pretty card of our choosing and I loved this quote from Rudyard Kipling, beseeching us to delight in simple things. Obviously, meant for me. 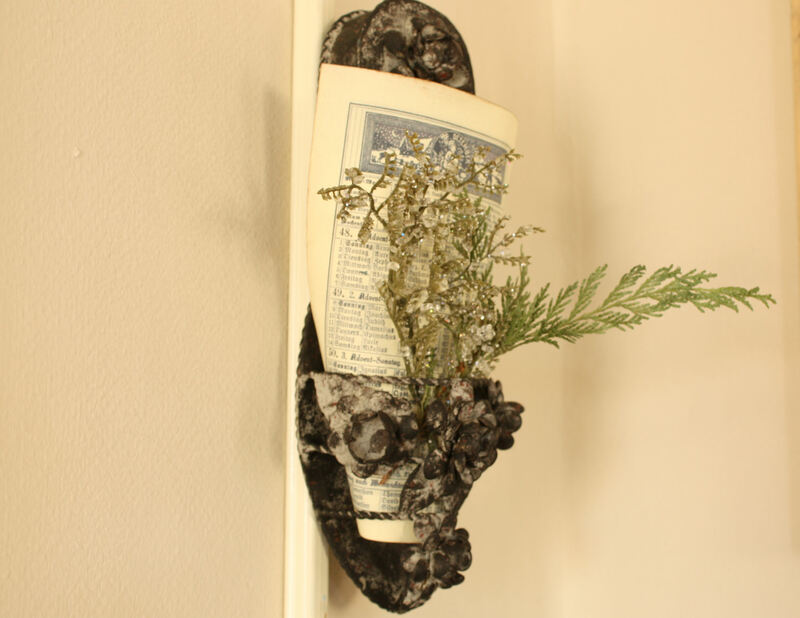 I gave it a decorative clip around the edges and then put it in the center of the greenery with an old band instrument music holder. OK, pure randomness...does anyone else decorate their necessary room? Toilet, potty, bathroom, water closet, whatever you call it. I do, I must admit. I have the great blue and white dishes in there all the time (you mean everyone doesn't have dishes in their potty? Hmmmmm, what's wrong with them???? ), so I thought a little touch of Christmas was in order in there as well. 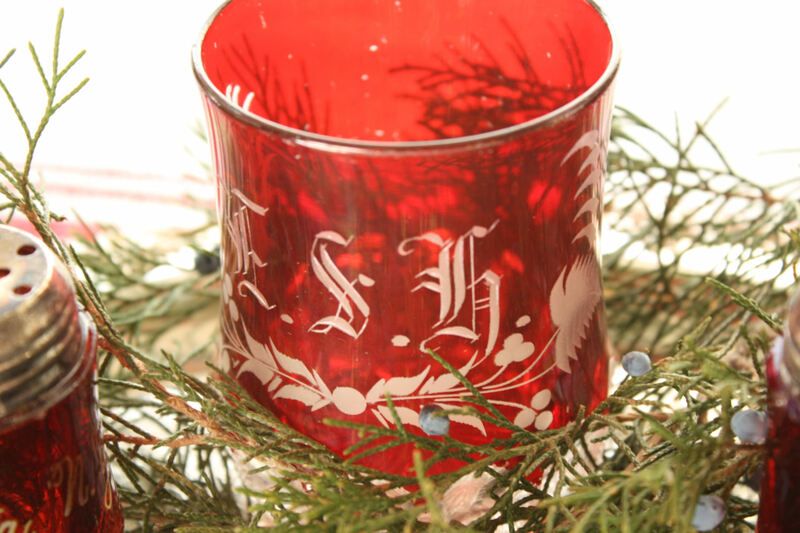 Moving on to the dining room, I pulled out my Victorian red flash glass souvenir pieces for a little red love. 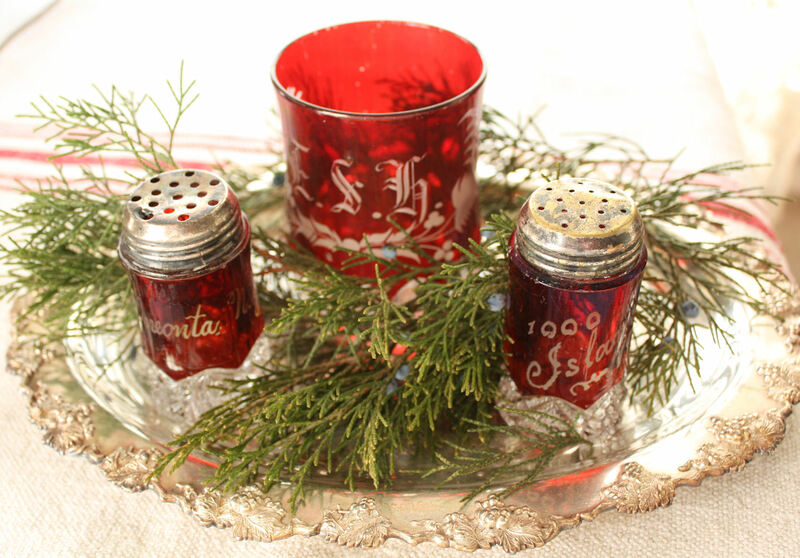 These fun little glass items were keepsakes from various tourist destinations. Often, people would have them personalized like this glass with the initials E.S.H. How can you not be charmed? So, anyway, I also changed out the pastel quilts I display in my entryway (didn't photograph that) with my red and white and red, blue, and white ones for the first time in years and it is so nice to see my old friends. 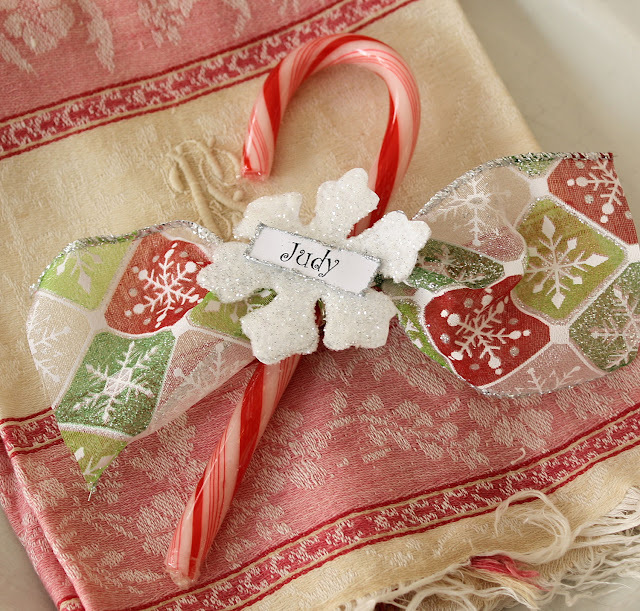 I think red and white and I are going to be spending a little more time together this year. How about you? What did you think you were over that it turned out you still loved? 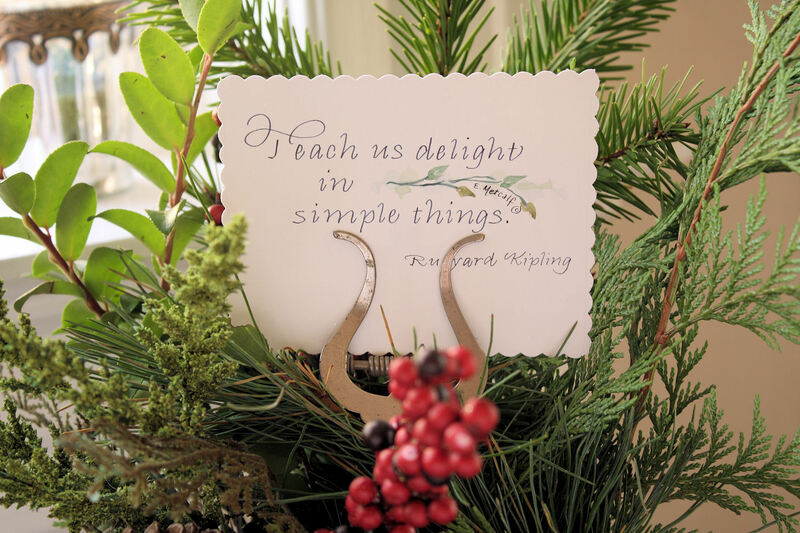 Hello Friends, I hope you are all well and happy and enjoying this beautiful season. 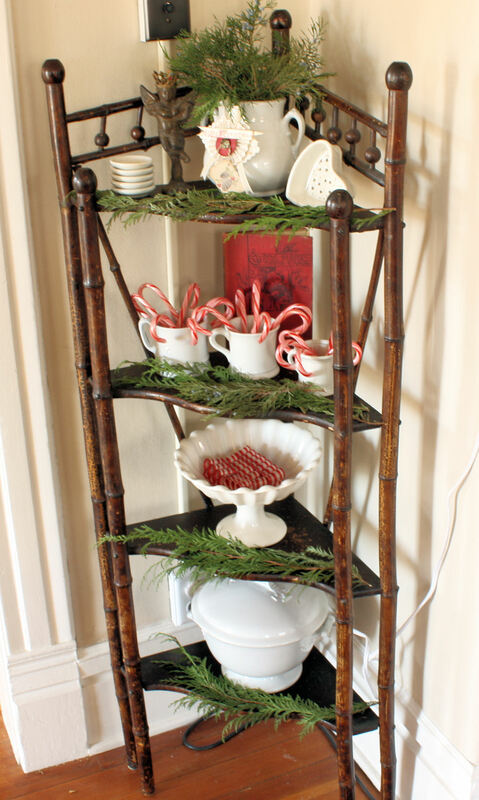 I was so behind in my decorating I really was feeling a need to keep it simple yet appropriate to the season. I went out shopping a little before Thanksgiving and just the sheer volume of "stuff" on the shelves and the tinsel-y shininess and the hustle and bustle made me want to run out of the stores and take a shower to wash off the dirt of the conspicious consumerism. I don't know if it's my age or what, but it really bothered me this year. 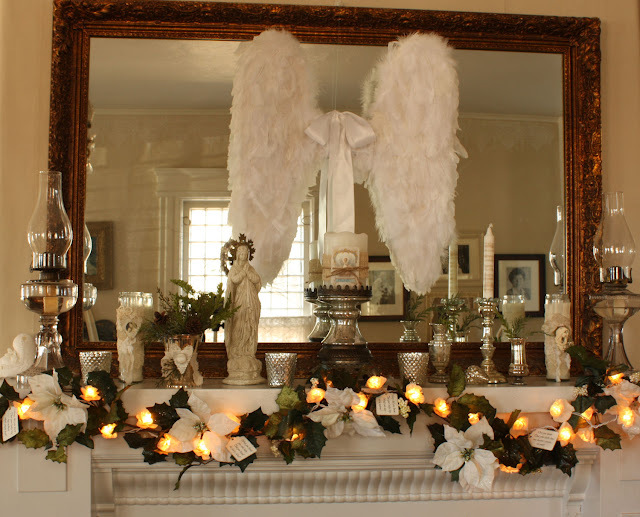 SO, I decided to do a revisit of my last year's mantel and tweek it a bit taking a cue from some favorite things that put the emphasis on the reason for the season. 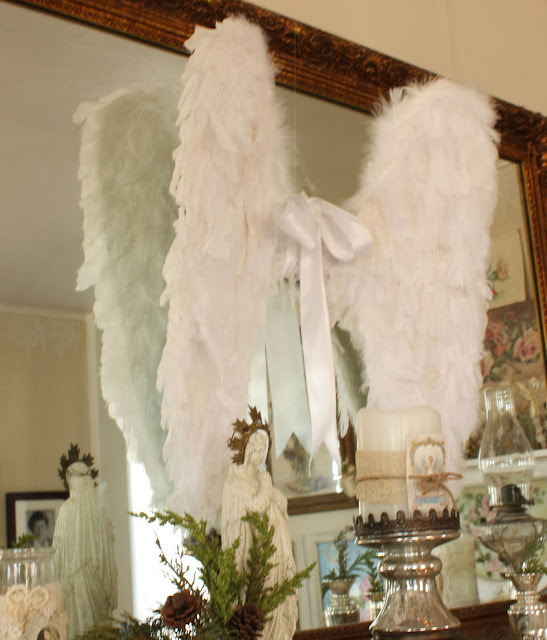 As I was working on my wings, I had Christmas music on and heard one of my favorite songs, "Mary, Did You Know?". I was inspired to take some of my favorite lines from that song and put them on simple hang tags. I added a little glitter around the edges since the tags just needed a little more "somethin, somethin". 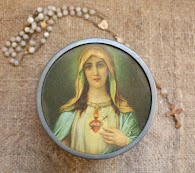 Of course, my JDL madonna had to come out to say hello as well. 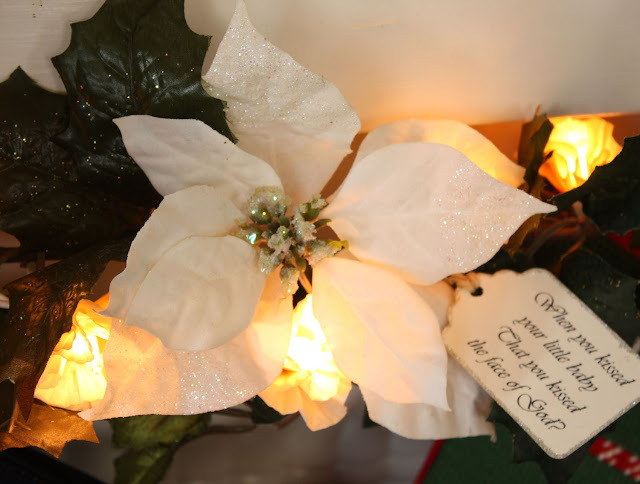 A relatively simple white poinsettia garland that I had on hand made a nice addition when paired with the fairy light string I made last year out of little coffee dyed tiny muffin baking cups. 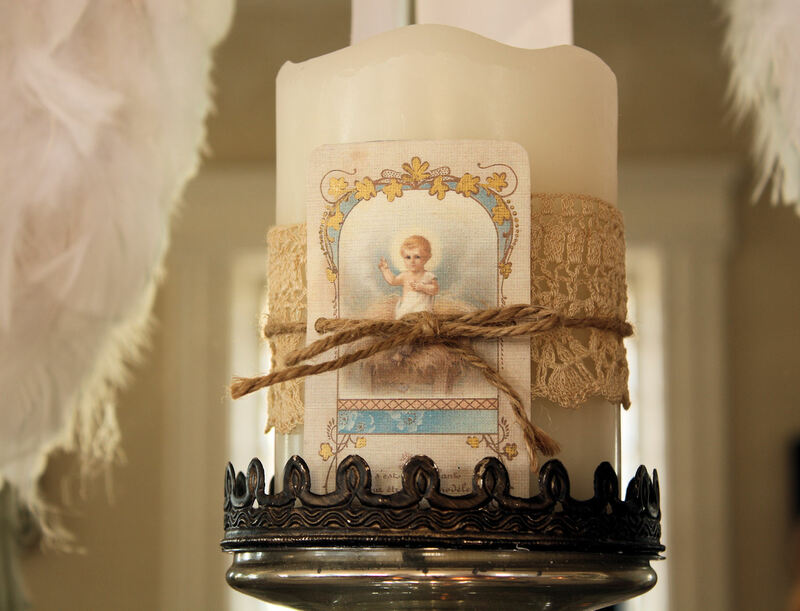 My JDL inspired candles returned this year and couldn't have been a nicer addition given the theme. 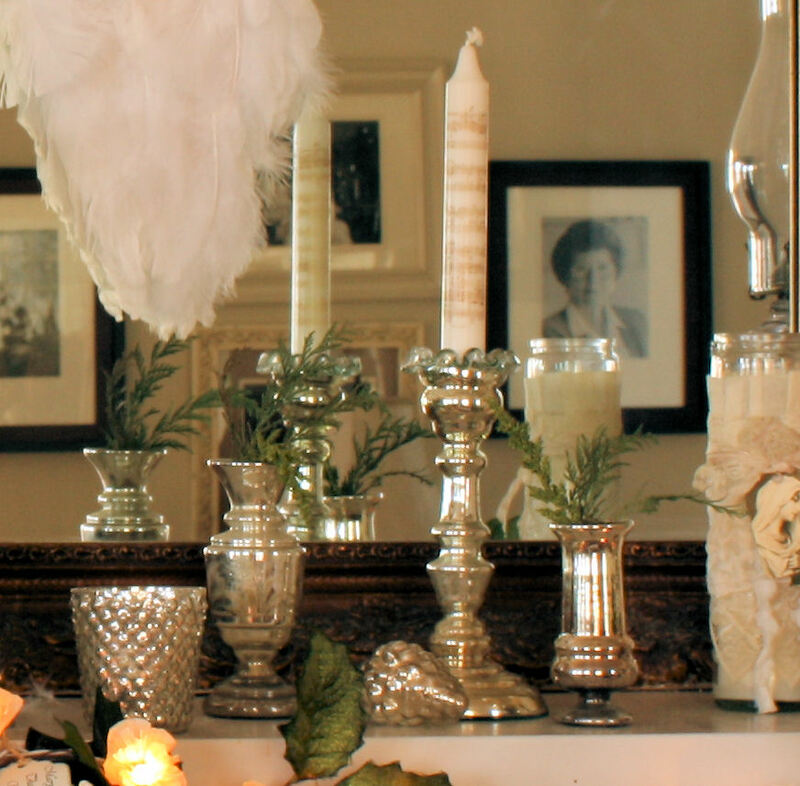 Antique mercury glass also back for a repeat performance...looks perfect with the Pottery Barn votives that were very reasonable at I think $3.50. I recently purchased a couple of gorgeous, very old prayer cards that featured the baby Jesus. I wanted to feature them on my big pillar candle but couldn't chance ruining the original, so I made a copy of it on a nice cardstock and went over the gilt scrolls with my gold paint pen. I've done this on other reproductions of old pieces and it gives it that authentic look that I love. I don't think anyone would be the wiser. I punched a couple of holes in my card for my jute twine to go through so it would stay relatively flat and tied it up over a layer of old crocheted lace for a nice layered effect. 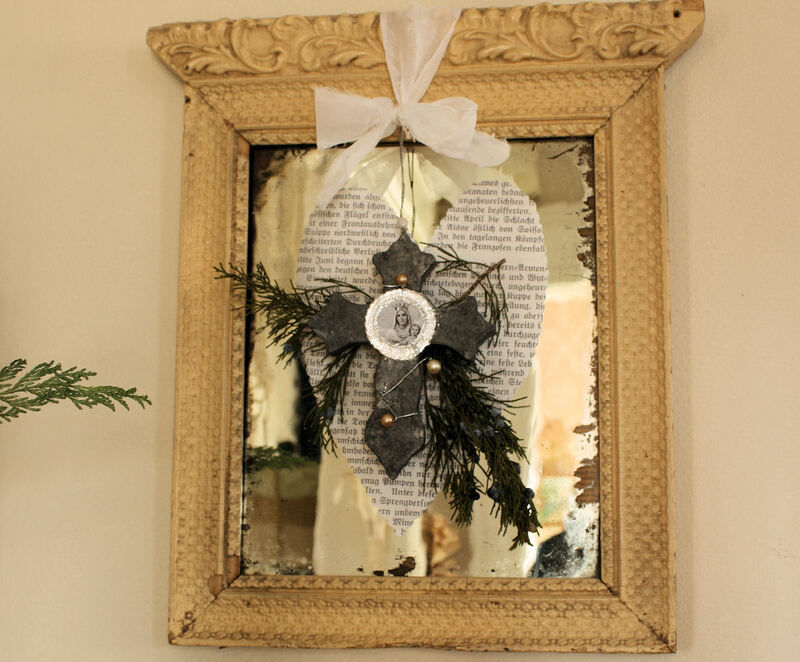 Lastly, one of my favorite mirrors that usually sits on the mantel was moved to the wall and I added the heart cut from a German book topped with one of my faux zinc crosses and some greenery. I love the simplicity of it. 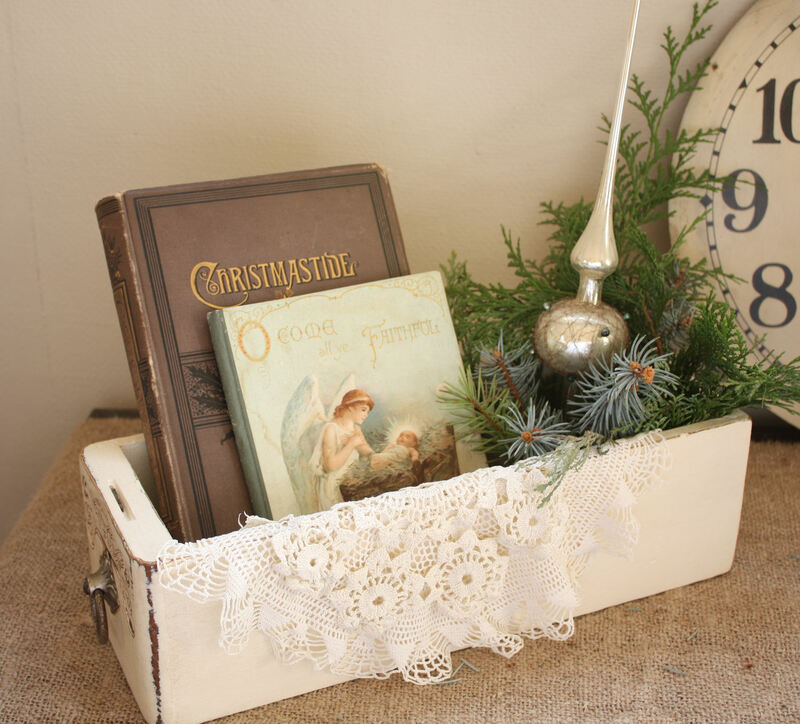 There are still some crosses available in my Etsy shop, Elegant Farmhouse. 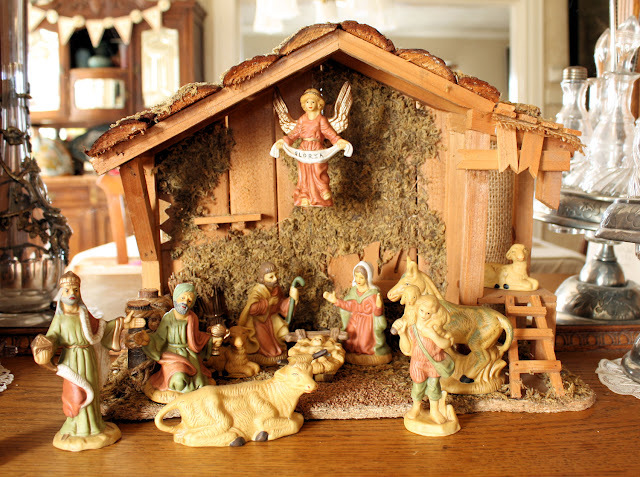 One of my nativity sets that my husband got me soon after we married. I love it. 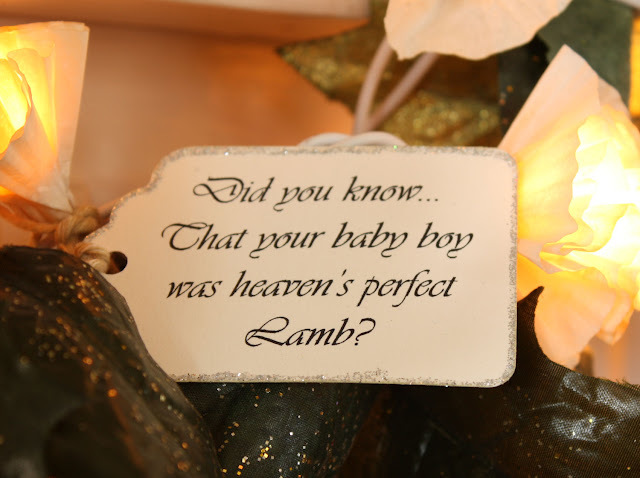 It is a great visual of the reason for the season, the birth of Jesus. I'll show you more of my decor soon, but for now, I think that's enough photo overload. I'm sharing the goods this week with Kathleen at Faded Charm and her wonderful White Wednesday Party, Kim at her Wow Us Wednesday Party, Debra at Vintage Inspiration Friday, Courtney at Feathered Nest Friday, and Bev at Pink Saturday. 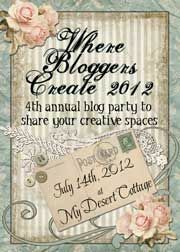 Go over and show the other participants some blogger love, won't ya? 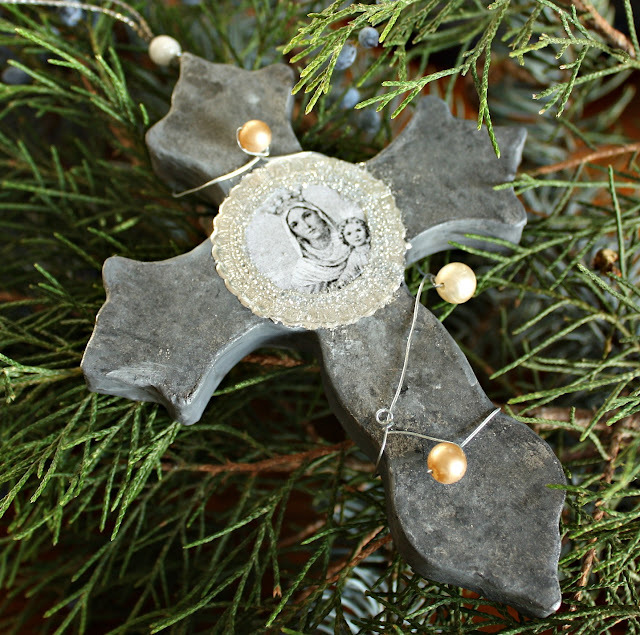 UPDATE: Faux zinc ornaments are now up on my Etsy shop. 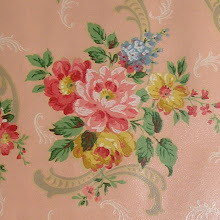 Victorian ones will be up Monday night. Let's just be clear on one thing...I love zinc. Old, weathered zinc makes my heart sing. 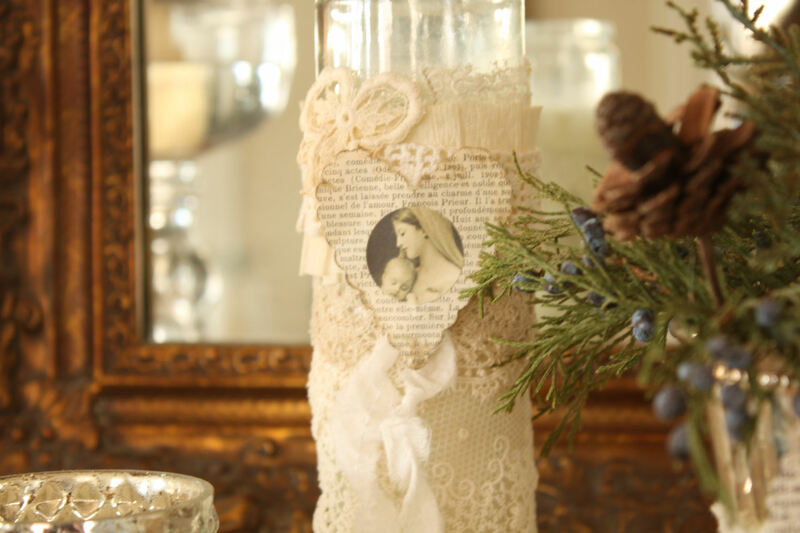 Even if the look is a little rustic for my Victorian "looks like Grandma's house" home, I try to get a little Jeanne d'Arc here and there wherever I can sneak it in. 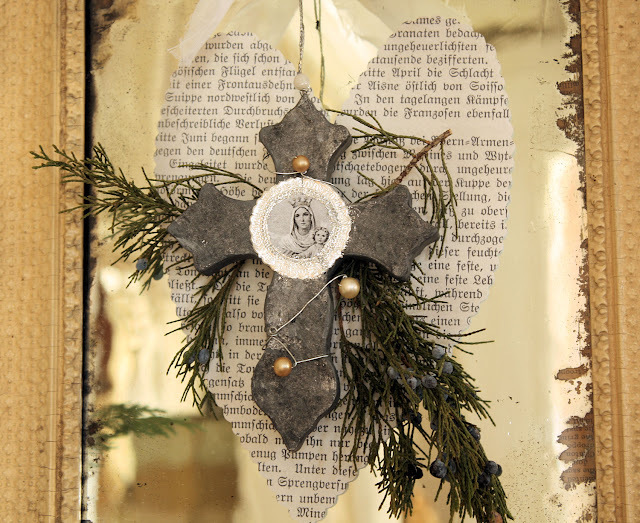 As you probably know though, cool antique shaped objects like crosses don't exactly fall from the sky. With this in mind, I decided to make my own zinc Christmas ornaments. 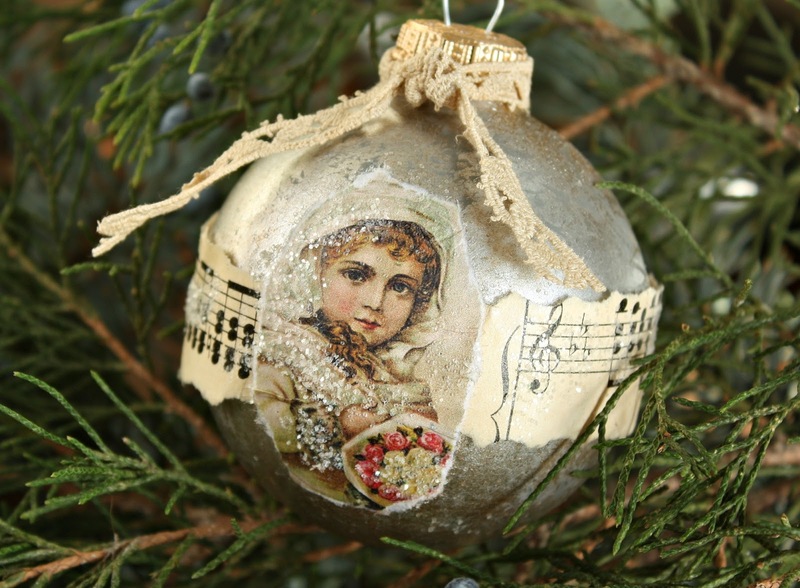 I think these large ornaments turned out pretty darn cute, what do you think? And they really look just like zinc. But what are they you ask? They are paper mache. Yep, paper mache. I had one at work the other day and my coworker swore they were at the very least, some kind of metal. Then I handed it over to her and was she ever surprised. I made several up and I will get them in my Etsy shop this weekend in case you love them as much as I do. I will do a tutorial just as soon as I get a chance; I foresee myself using this little technique many times and I'd love to share it with you. I also made some of these beauties and foofed them up with 2 or 3 different paints, images, glitter, lace, and whatever else struck my fancy. I'll have them up in my shop this weekend also. I got the idea for these from the Christmas issue of Jeanne d'Arc Living. It really is a nice issue (yes, aren't they all, right? 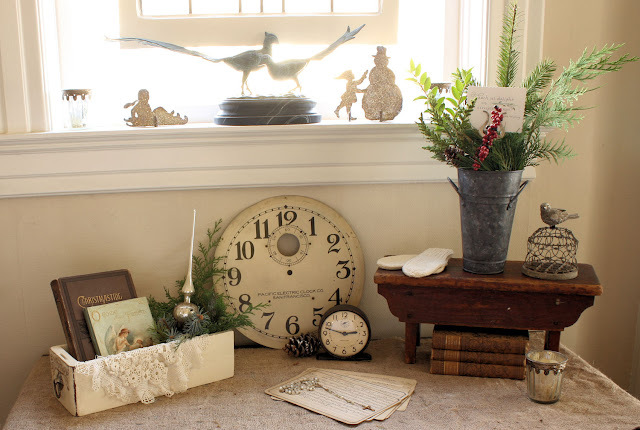 )-lots of serene decorating ideas. Most of my images, including the ones you see here, are from the Graphics Fairy. Thank you, Karen for such great material to work with. I'm going to be sharing these with some linky parties. Hope you can hop along with us to some great destinations for inspiration galore.